Paula, our instructor for this Seminar, holds a B.F.A. from Parson's School of Design, New York. She has 25 years design experience and works as a Sr. Graphic Designer for a small Connecticut printer. Her freelance work includes public service campaigns for a wide variety of national organizations including the American Heart Association, NFL and National Parks Foundation. 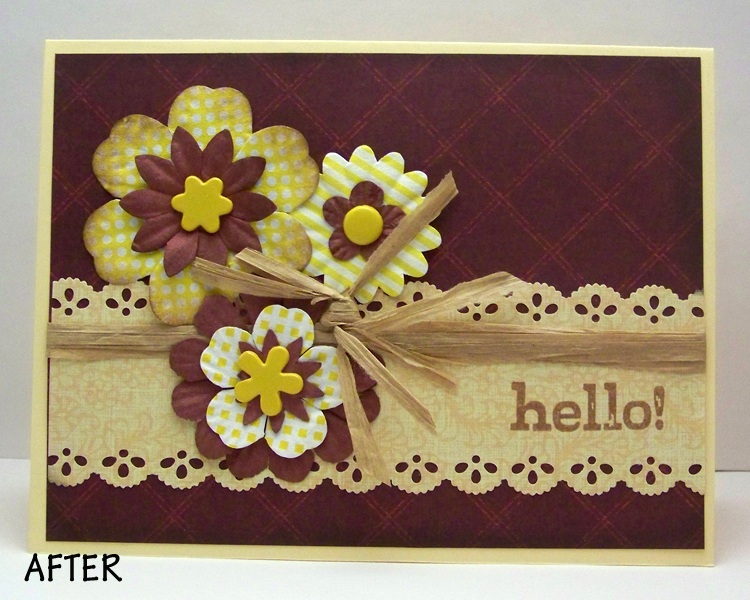 Let’s look at the samples I’ve created to help demonstrate. In this before sample I’ve attempted to balance my elements evenly by placing one in each corner. What particular spot is your eye drawn to? The bow? The brads? The sentiment? Which sticker? There is no one obvious answer in this case. You could say that all the elements (3 stickers, 3 brads and the bow) have the same “weight” to them. As you’re practicing creating strong focal points you can test how you’re doing by asking a couple of people what part of the card their eye is first drawn too. When you have a strong, planned out focal point virtually every viewer will easily reply with the same answer. 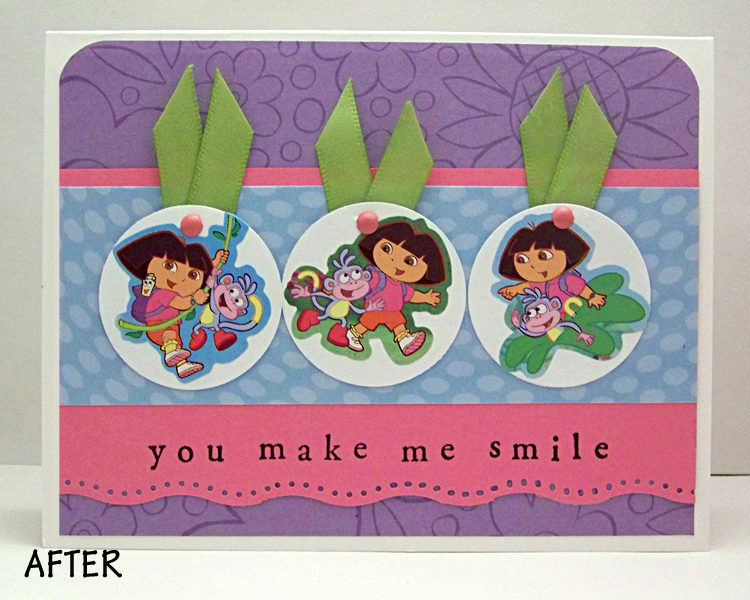 This after example uses almost identical elements with the addition of 3 simple white punched circles and a piece of scrap pink paper, but in this case your eye is drawn directly to the center of the card. I’ve added contrast by placing the stickers on the round white punches and grouped them closely together so that they form a single focal point. The addition pink scrap helps to frame the focal point. The curvy punched edge and the rounded upper corners of the background repeat/echo the roundness of the white circles. In this before sample I basically have two elements each on it’s own portion of background resulting in a split feeling. The flower and the tag are roughly the same size and compete for the viewers attention. Some will look at the flower first while others may look at the tag. In this after example I have used a slightly larger flower, to introduce some variation, and I have moved the elements much closer together so that they now have a very obvious relationship to one another and work together to create one strong focal point. Note that there are 3 elements in this focal point (flower, tag and ribbon). 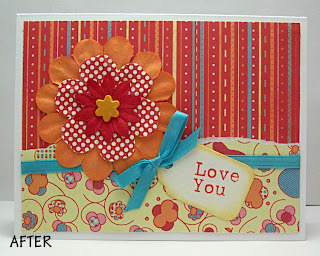 In this before sample the focal point is the image/sentiment combination, the largest element on the card. In the after sample, I have added strength to it by adding contrast. 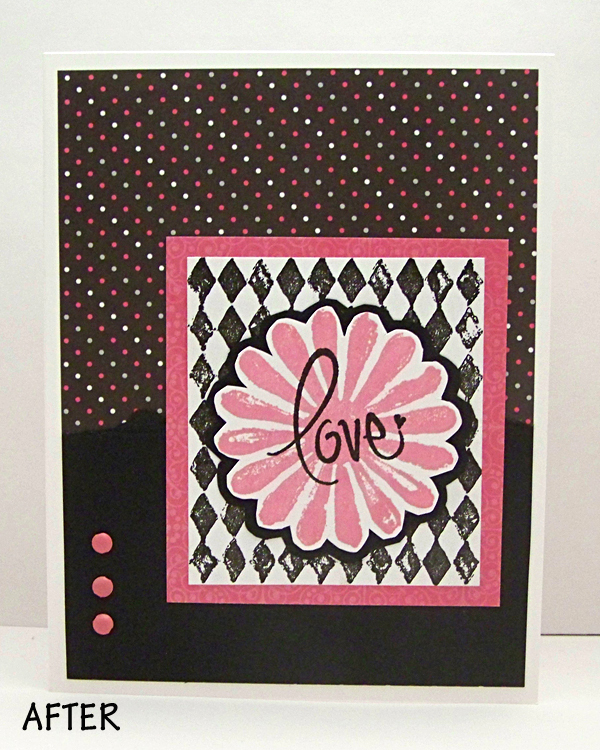 The white background in stark contrast to the black and pink stamping makes the image pop out and really draws the eye to it. 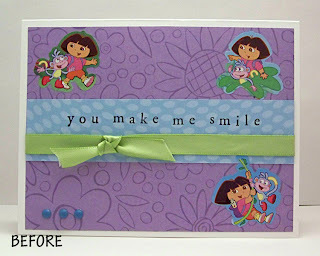 Bordering the image in the pink not only frames and separates it from the background, it makes it slightly larger overall and results in a better proportion of image to background. The stronger contrast of the pink brads makes them more important and helps to adds a nice balance to the overall design. 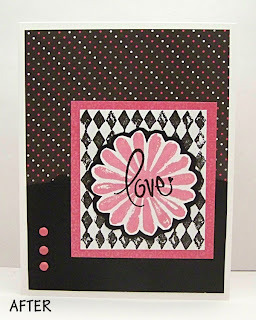 Again, in this before sample I’ve attempted to achieve some balance by spreading my elements out around my card. They are similar in size and tend to compete for the viewers attention in this design. By grouping them closely and tying the ribbon into the center of them I have created one strong focal point that the eye is drawn to immediately. 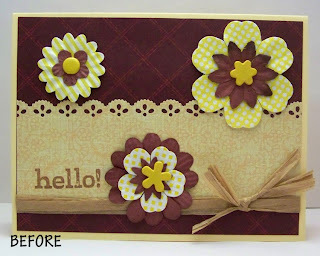 Some other minor changes I made in this after version were to scallop the second side of the paper strip (to both add some detail and to allow more of the brown background to show), to ink the edges of the larger yellow flower (to add some definition where it overlaps the smaller yellow flower) and chalking the corners of the background in black to create a bit of a stronger contrast against the base of the card. Of course it takes a bit of extra time to plan and analyze your designs but with enough practice it will become almost second nature and the results will be well worth the effort. To help you keep these concepts in mind I’ve created a printable PDF that you can keep handy by your crafting table, or share with your stamping group! Download it by clicking here. Choose one or more old cards that you made (they could be last week or 10 years ago! ), and analyze them - do they have a focal point? Are they scattered? What could be done to improve them? Create a new version (new papers/sentiments/embellishments are fine) showing how you could improve the older card. Post both of them on your blog, ask your readers to answer the question: "Where does your eye go on this card?" and link it below using McLinky. No blog? You can use Flickr or another free online gallery that allows comments; or upload your card directly using McLinky, but there will be no opportunity for the instructor or anyone else to leave you comments, so we recommend a free Flickr account. Please do NOT upload using Facebook images. Repeat #1 daily (or as often as you can!) for the next 2 weeks. You can also create totally new cards, but we'll all learn more if you're able to share a before/after pair of cards! Visit the others who link here, and leave them feedback. Be specific, and encouraging - let's all learn together! In two weeks, on February 12, you can enter ONE of your focal point cards to potentially be posted in a photo album on our site. The instructor will choose which ones get uploaded, so pick your best---let your commenters help you decide which one really rocked the assignment! In four weeks, February 26, the instructor will choose a number of cards to analyze here on S&S for further learning by us all! Love, love, love the seminar! Thanks for all the great tips and examples. I can't wait to go (re)create now. Wow what a difference a little change makes! When I looked at your before pictures the first thing that came to my mind was how similar they were to mine. Then looking at the after pictures it was like a lightbulb moment, "so THAT's why those other cards I look at are so attractive!" Thank you so much for your guidance! Great tips! Gives much to think about as I create future cards! Great tips! Thanks very much! Fantastic first seminar, Paula! Excellent tips and tricks! I loved looking at the before and after and learning how to make better cards. 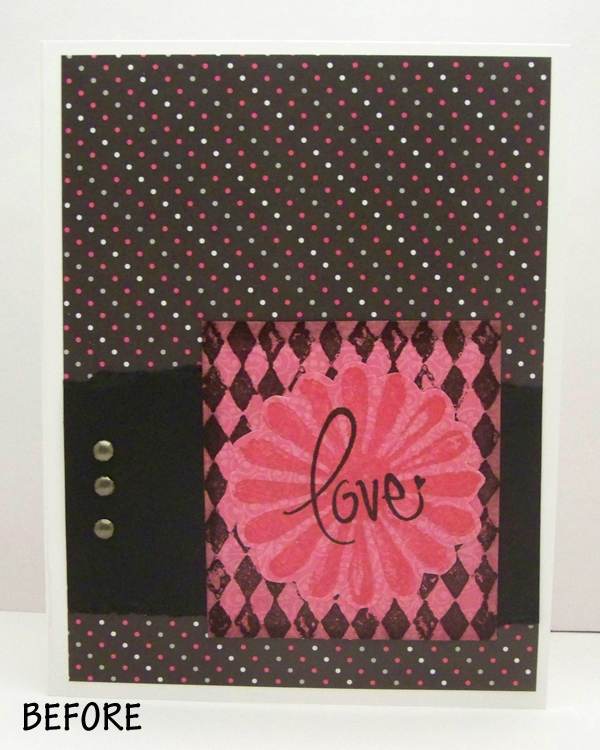 I have no design background, just love crafting, so this was a huge help. Speaking of help, I wasn't able to link to the pdf of the class. It went to what looked like the html of the OWH home page or something. Can someone help me? Thanks! Sorry Allison! I goofed up the html. It should work now! OMG, Sandy! Thank you so much. I just love how concise that PDF file is with the pics of the cards and everything. I'm going to start a notebook with Saturday Seminar notes in it to refer back to often. Thank you, thank you, thank you for all of your hard work!!! Thank you for the valuable tips! They really made a difference in the AFTER cards. Thanks for sharing such valuable knowledge with us! I've learned a lot and really appreciate the time you took to do this! Very good information on grouping an contrast. I am usually a spreader (spreadng it all over he page). I'm going start using this focal point method also. Thank you so much, especially to Paula! It was easy to use the seminar, and I loved the before and after examples. 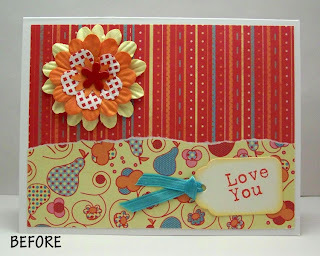 I really enjoyed using the focal point ideas to revise my card. WOW! This is fantastic and really helped me to put more thought into making sure my cards have a focal point. 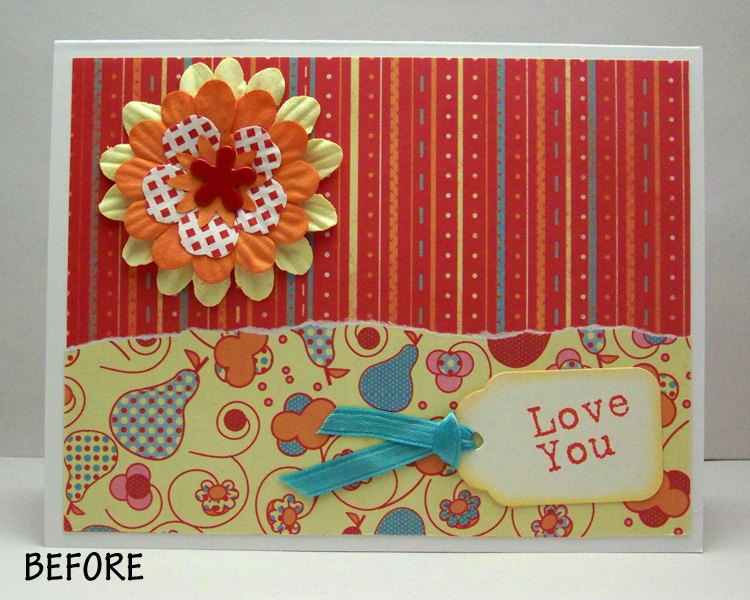 I can't believe how much better your cards looked in the 'after' images!! Thank you for a fabulous seminar!! Not trying to complain but the inlinks is definately a better upload tool than the Linky tools. I don't think that linky is very user friendly. Here's a card I made trying to keep my focal point in mind.